You can smell the foliage oils of Salvia mellifera as you walk by without even touching the plant. This scent brings back childhood memories of running down trails hurdling the branches that stuck out over the trail. The pale blue to white flowers stand out when they are visible against the dark bumpy leaves. In the garden setting care must be taken not to water too much in the summer. Salvia mellifera can withstand winter rainfall but not living in a bog. Naturally the Black Sage is found on South and West facing slopes on rocky soil in California's coastal sage scrub plant community. 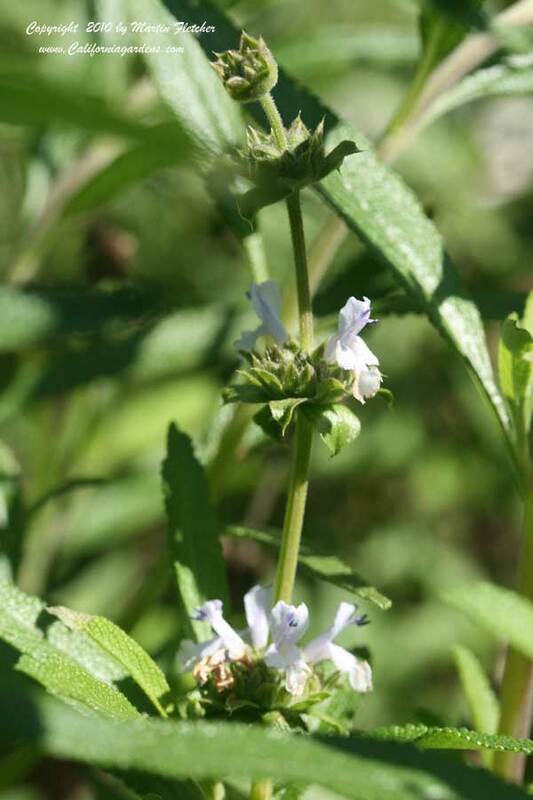 Care in siting Salvia mellifera must be taken in fire prone areas as the Black Sage burns quite well so planting it against your house might not be such a goood ideal. There is a low growing selection of Salvia mellifera, Salvia tera seca, that is more fire safe due to the low stature of the plants. Salvia leucophylla, Salvia mellifera, and Salvia apiana hybridize freely. Some of the crosses have beautiful flower and foliage textural attributes from each of their parents.Salvia mellifera is a nectar source for the Painted Lady, Mournful Duskywing and the California Dogface Butterfly, Cloudless Sulfur, and the Northern White Skipper and a great addition to the hummingbird garden as well as the butterfly garden. Many think that Black Sage is the best source plant for sage honey. High resolution photos of Salvia mellifera are part of our garden image collection.